According to the Darwin VAAC a pilot observed a small "smoke" plume rising from Cereme on 24 June; ash was not identified in satellite images. Ongoing seismicity continued during 27 October-30 November 2003 (table 1). The number of A-type volcanic earthquakes peaked during 3-9 November (53 events). Hot spring temperature measurements were 47°C at Sangkan Hurip, 50°C at Cilengkrang, and 43°C at Ciniru. No significant visual activity was reported, and the hazard status remained at Alert Level 2 (on a scale of 1-4). Table 1. Seismicity registered at Cereme, 27 October-30 November 2003. Courtesy of VSI. DVGHM raised the Alert Level at Cereme to 2 (on a scale of 1-4) on 13 October after increases in seismic and volcanic activity. During 13-19 October, the seismic network recorded 36 deep-volcanic earthquakes. Seismicity decreased during 20-26 October, with 7 deep-volcanic earthquakes recorded. According to news reports, local authorities issued an alert and closed Cereme to the public after detecting unrest. Several earthquakes were recorded on 17 October. Seismicity increased on 18 October, when 18 earthquakes up to M 2 occurred. Seismicity was felt in seven subdistricts of the Cilimus and Pesawahan districts. Data from the Volcanological Survey of Indonesia (VSI) indicated a tectonic and volcanic earthquake at Cereme on 25 March, followed by one more volcanic event on 28 March. Activity picked up on 2 April with three more volcanic events, with 17 events through 14 April. Daily highs of 8 and 11 events were recorded on 24 April and 3 May, respectively (2-4 May had 22). Seismicity remained generally low (0-3/day) until 29 events occurred on 7 October. After a felt earthquake on 7 October, volcanic earthquakes increased. This increased seismicity was accompanied by elevated visually observed activity, resulting in the hazard status being upgraded to Alert Level 2 on 13 October. Seismic activity during 6-12 October consisted of 46 deep volcanic earthquakes and 15 shallow volcanic earthquakes; 36 deep volcanic events occurred the following week of 13-19 October. There was a felt earthquake on 19 October that lasted for 95.5 seconds (35 mm amplitude). Seismic activity declined during 20-26 October, when only seven deep volcanic earthquakes were recorded. The temperature measured at the Sangkan Hurip hotspring in late October was 48°C, unchanged from previous measurements. Information Contacts: Dali Ahmad, Hetty Triastuty, Nia Haerani, and Suswati, Volcanological Survey of Indonesia (VSI), Jalan Diponegoro No. 57, Bandung 40122, Indonesia (URL: http://www.vsi.esdm.go.id/); Darwin Volcanic Ash Advisory Centre (VAAC), Bureau of Meteorology, Northern Territory Regional Office, PO Box 40050, Casuarina, NT 0811, Australia (URL: http://www.bom.gov.au/info/vaac/). The symmetrical stratovolcano Cereme, also known as Ciremai, is located closer to the northern coast than other central Java volcanoes. 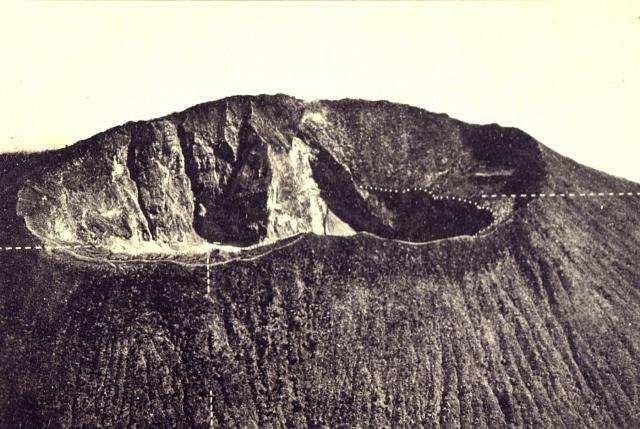 A steep-sided double crater elongated in an E-W direction caps 3078-m-high Gunung Cereme, which was constructed on the northern rim of the 4.5 x 5 km Geger Halang caldera. A large landslide deposit to the north may be associated with the origin of the caldera, although collapse may rather be due to a voluminous explosive eruption (Newhall and Dzurisin, 1988). Eruptions, relatively infrequent in historical time, have included explosive activity and lahars, primarily from the summit crater. Hamidi S, Djuhara A, Martono A, 1993. Volcanic hazard map of Ciremai volcano, West Java. Volc Surv Indonesia, 1:100,000 map. There is no Deformation History data available for Cereme. There is no Emissions History data available for Cereme. The prominent 3078-m-high symmetrical stratovolcano Cereme, also spelled Ceremai, overlooks the major Java Sea city of Cirebon. The steep-sided double crater, elongated in an E-W direction, that caps Gunung Cereme is seen here from the south. Cereme volcano was constructed on the northern rim of the 4.5 x 5 km Geger Halang caldera. Eruptions, relatively infrequent in historical time, have included explosive activity and lahars, primarily from the summit crater. 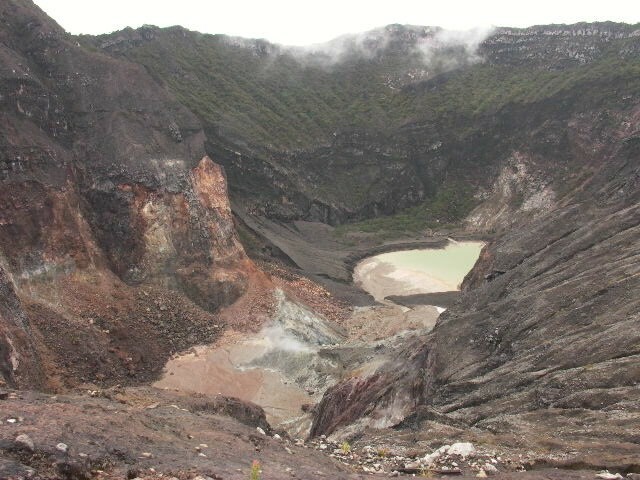 A small lake occupies the steep-walled summit crater of Cereme volcano in central Java in this 2004 view. The symmetrical stratovolcano, also known as Ciremai, is located closer to the northern coast than other central Java volcanoes. A steep-sided double crater elongated in an E-W direction caps 3078-m-high Gunung Cereme. Eruptions from Cereme, relatively infrequent in historical time, have included explosive activity and lahars, primarily from the summit crater. There are no samples for Cereme in the Smithsonian's NMNH Department of Mineral Sciences Rock and Ore collection. Large Eruptions of Cereme Information about large Quaternary eruptions (VEI >= 4) is cataloged in the Large Magnitude Explosive Volcanic Eruptions (LaMEVE) database of the Volcano Global Risk Identification and Analysis Project (VOGRIPA).